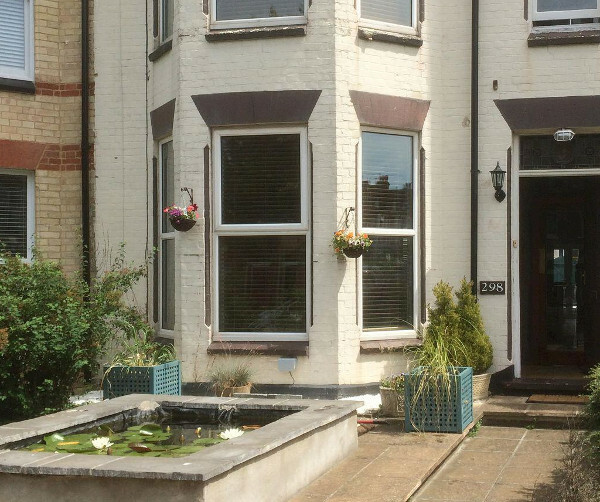 Ternstone House is a large Victorian holiday cottage in the north Suffolk town of Lowestoft. Ternstone House sleeps 9 people in 5 bedrooms - and what really makes this a lovely cottage is that the sandy beaches are only a 2 minute walk from your cottage. Ternstone House sleeps 9 people in 5 bedrooms, with the bedrooms being made up four king-size beds and a single bed. There are 3 bathrooms at Ternstone House. The living room has a TV, iPod dock, and a wood burning stove - which is an excellent addition if you want to take holiday in the colder months of the year. You can explore the coast and return to warm your toes in front of that wood burner. The kitchen has a breakfast area, electric oven, gas hob, combi microwave/oven/grill, fridge/freezer, dishwasher and washing machine. You have a separate dining room too. Outside you have an enclosed courtyard with furniture. Ternstone House has Wi-Fi, with your towels and bed linen included. What we really liked about Ternstone House is it's location. The position of Ternstone House is what earned this cottage our "Cottage of the Month" title. You can pop to the vast sandy beaches of south Lowestoft in 2 minutes. The video below was taken on the sea-front, on a sunny July day, opposite Ternstone House. Lowestoft sea-front has a glorious beach, with life guards protecting your swim. The beaches here consistently obtain the Blue Flag award for cleanliness too. For those who like a explore the area by bicycle, the upper promenade has a cycle lane which leads north into the town centre (with cycle routes taking you off to Great Yarmouth, should you want to go further); or south to Kessingland and, further afield, to Southwold. Or just stay in by the beach, and treat yourself to some fish & chips! Oulton Broad is 2 miles from Ternstone House, and marks the start of the Norfolk Broads. From Oulton Broad you can hire a motor-cruiser and spend an hour or two discovering the Broads. I mentioned Southwold earlier, this quintessentially English town is 10 miles from Ternstone House. There are hundreds of places you can visit during your time in Lowestoft: Africa Alive (3 miles), Beccles Lido (10 miles), BeWILDerwood (30 miles) - it just wouldn't be possible to name them all! If you quite fancy a holiday at Ternstone House, and have any questions about Lowestoft, feel free to send me an email on john@cottage-choice.co.uk - I'm a Lowestoft fella, so maybe able to help with your holiday questions. Video of Lowestoft seafront, with a little bit of Ternstone House too. Who wants to go overseas? Come to sunny Lowestoft and enjoy the fantastic beach. Should Ternstone House not be to your liking, but you fancy staying in the area around Suffolk, you might well be interested in the cottages below. All these cottages are within a few miles of Ternstone House.